Labour must recognise that Trump supporters in the US have a great deal in common with Brexit supporters in the UK. The Brexiteers and the triumphant right-wing media have occupied the political sphere in the UK and are using it to impose a worryingly right-wing flavour on what happens next. 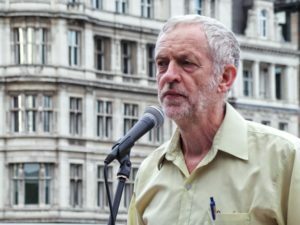 The left-behinders in the UK will not benefit from a hard Brexit. Labour must therefore reposition itself more clearly to address the concerns of these people who in the past have been strong Labour supporters. It must always emphasise that Labour are leading the way towards a fairer society. Immigration is important to them because there are many jobs in the UK that are poorly paid with mediocre working conditions. We have a society that people working full-time with available tax credits can still be in poverty. Our schools produce children badly educated and ill-equipped for the 21st-century. The NHS is under appalling pressure because of lack of staff at least in part because training places are not available for the large numbers of student applicants. Above all it is the economy that hurts them and the way that it has been distorted to their disadvantage. Conservative cuts to social services and the NHS, education and local council facilities are all very obvious to those in poorer areas with little chance or hope of a better future for themselves and their children. Labour must make much more of the reality that a great deal of the unhappiness in the US and in the UK is driven by this inequality and apparent lack of concern by the centre for what is happening in the poorer regions. The present Conservative government leaning increasingly rightwards is unlikely to address these demands despite the fine words of Theresa May when she took over as Prime Minister. Labour needs to establish a detailed economic and social programme that will convince traditional Labour supporters that it understands what they want and has a plan to deliver it. The plan has to be comprehensive and convincing. It has to be structured so that it is relatively immune to the inevitable attacks from the right-wing media and the right-wing of the Conservative party. Articulating a plan like this is something that right-wing Brexiteers will have great difficulty in doing, particularly as the hard Brexit they seek will be economically damaging particularly to the poor. Outline of a strong, radical programme for Labour. The key question is where is the money coming from? The plan must start with radical changes to the current taxation system if the plan is to be credible. The use of the Land Value Tax (LVT) is key to unlocking the £6 trillion held in residential property in the UK and the just under £1 trillion held in commercial property. This property has increased in value by about £330 billion per annum averaged over the last five years. A 20% tax on that growth will generate £66 billion per annum for the Exchequer. Those who are cash-poor can accumulate their LVT until they can afford it or the property is sold. Addressing widespread corporation tax avoidance is a critical part of making the UK a fairer society. This could either be in the form of an infrastructure charge (see: http://tinyurl.com/h9wjn25) or the Alternative Minimum Corporation Tax suggested by Richard Murphy (see: http://tinyurl.com/ho6yy73). These similar approaches could yield perhaps £17 billion per annum. Together with LVT, such an approach would transform the balance sheet of the UK government. The minimum wage should be progressively raised to the point where a family with one full-time wage earner is guaranteed to be above the poverty level, without needing help from tax credits. A program to require significant improvements to the minimum working conditions must be developed together with the ability of the state to enforce those regulations. We must invest significantly in our education system and look carefully at countries that manage to produce much better outcomes than the UK. For example, in Finland attainment is very good indeed on an international scale. Yet in Finland children spent less time in class, have no homework and no interminable exam package. They are much less stressed and worried that our children are and we must think very carefully about how this can all be improved. At the tertiary level, Tony Blair dismantled the network of technology colleges. Universities were encouraged to accept many more students for university degrees further devaluing the importance of technical and vocational qualifications. We are very short now of skilled people in industry, construction and many other areas. This was not the case 10 years ago. The Technical College network need to be reinstated and the universities encouraged to emphasise qualifications in areas that are important for the UK and discourage those in areas where their effect on job prospects of the students is slight. Fees should be substantially reduced and indeed could be eliminated for subjects such as STEM and medicine. A major programme of housebuilding must be introduced with the emphasis on building substantial numbers of low-cost, genuinely affordable houses. For a variety of reasons (see: http://outsidethebubble.net/2016/09/27/a-fairer-deal-solving-the-housing-crisis/) it is probably essential to use prefabricated construction methods partly to produce houses at the rate we need while maintaining top-quality and keeping prices down. Money needs to be put into infrastructure development, not vanity projects like HS 2, but into programs to improve rail, road and other infrastructure components. Part of that money should be dedicated to improving infrastructure in regions that are particularly affected by being in the British rustbelt. In particular these regions should be a priority for the introduction of good quality high-speed Internet connections made available through wide coverage council Wi-Fi systems. Yet it is undoubtedly immigration that needs to be faced up to. As long as Labour fails to address seriously the concern of so many natural Labour supporters about immigration they will simply not be convinced by the other parts of this package. Short-term immigration by students should be removed from the count. The great majority of jobs taken by foreign-born workers are in skilled occupations and sectors even though these workers are often qualified for significantly better jobs. The need for these workers would be reduced substantially by a program to train British students in these areas. It is ridiculous that we have a shortage of nurses, for example, when 100,000 applicants have to compete for about 20,000 places and our hospital managers spend time overseas trying to recruit medical staff that Third World countries can ill afford to lose. Making the least well-paid full-time jobs in the UK able to take an employee and their family out of poverty would be the most effective way to help people move away from benefits. All these programs would allow net immigration into the UK to be reduced substantially. However we must realise that half the immigrants to the UK are from outside the EU and present policies and demands from within the country have failed to reduce that despite repeated promises by the Conservatives. Labour must work tirelessly to counteract the Conservative message that it is immigration that makes our regions so impoverished as they impact health, education and social care provision. The country simply cannot function without a significant number of immigrants and at some level it doesn’t really matter where they come from. Surprisingly, the success of Trump makes a more radical approach to the running of an economy more appealing. Many European countries have elections in the near future (Czech Republic, France, Germany, Luxembourg, Netherlands, Norway). We must expect that within the EU there will be increasing pressures from the same constituents that delivered Brexit and Trump. The realisation that the financial crash of 2008 has badly affected the prospects of many poor and middle-class families around the world is likely to be widespread. Concern about immigration is also widespread and it may be that if the EU starts to look more seriously at the problems generated by unrestricted internal movement. Indeed its reform might provide the basis of the new relationship to be negotiated between the UK at the EU after Brexit. This is the time to produce a comprehensive plan that is articulate and clear, with all the sums properly worked out and a clear idea in what order it is to be implemented. Labour has a great opportunity in a time of revolution and must do what it can to drive itself forward.